Kent also shares how Memphis Invest is on track to buy 800-900 more houses this year, and how our processes, systems, training, and hiring play a huge factor in getting to this level of business. In turnkey real estate, we’ve gained experience that has allowed us to expand to the level that we’re at while maintaining a huge commitment to our investors. Being a turnkey company means having both the financial means and enough staff to uphold your obligations to investors. 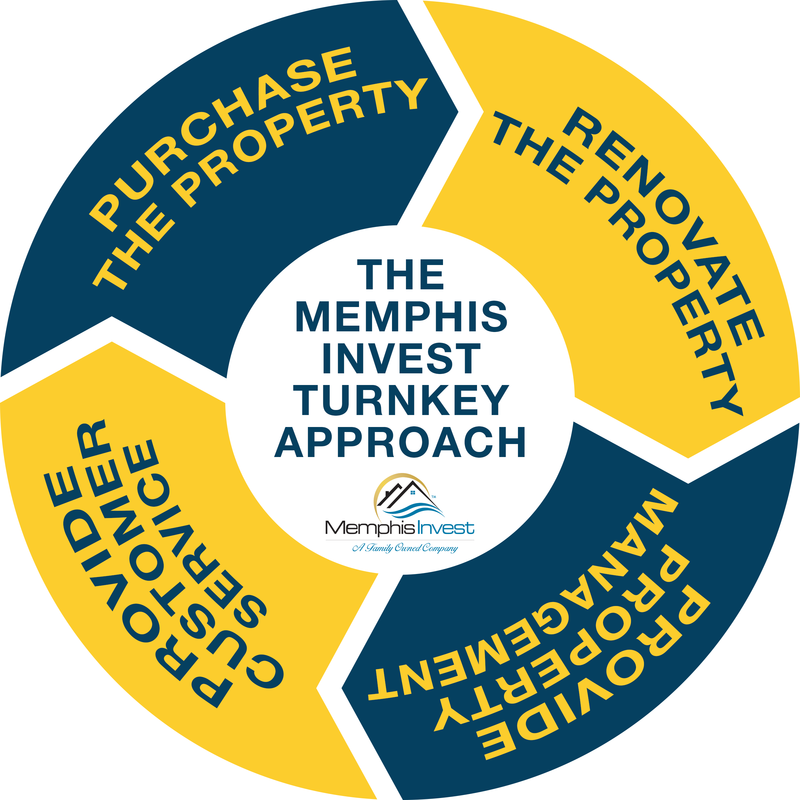 Approaching 90 employees in 5 cities and managing over 4,500 properties, Memphis Invest has maintained it’s level of excellence while providing a platform for our investors to expand their portfolios. How Do You Choose Who to Invest With? In case you missed our last episode, An Inside Look at Turnkey Investing, Kent and Chris also discussed the importance of WHO you invest with when choosing turnkey investing, and why it's the biggest factor to your success as a passive real estate investor. In the end, you want to make sure you’re not just working with a turnkey company that only flips houses, but that you’re dealing with a company that is in it for the long haul. Hear more tips on how to make sure you’re working with the right people, in the right markets, for the right reasons. Transcript Available at the end of this post. Experience Matters Podcast Transcript: What Makes a Good Turnkey Company? Hello everyone, welcome to the Experience Matters podcast. Kent Clothier Senior, your host today. Going to be joining my son Chris today, co-host, and sitting with us in this program today. I want to remind you that you find us on video at the MemphisInvest.com website, also at Stitcher, SoundCloud, and iTunes, and we hope you join us and leave your comments that we always encourage and read and bring up on the program. So again thank you for joining us today and I think Chris has got a topic for us today that we're going to get into that may help a lot of our listeners and a lot of our guests. Chris? Yeah. First thanks for having me back. I know that you had a choice between me and Kevin today and you asked me to do another one with you, which it's a big deal for me. Well, this is two or three in a row with you and I can't wait to get Kevin back in here, all right? Which your listeners they are probably not fully aware that there's a lot of truth in that, that you are probably ready to have Kevin back because I talk a lot. But this week dad we're going to just kind of stay with the theme. We've done three or four in a row now really honing in on the turnkey side of things, and the business and how it's been set up. I thought this week was a really chance dad for us to talk about what makes a good turnkey company. You and I have seen so many out there and had so many come to talk to us for advice, and not to pat us on the back but it is kind of funny when you look back at the three here in Memphis at how many turnkey companies started either from yourself or your original partner, or from learning the business from us in one way or another from providing service, then going out and becoming a turnkey company. So we've helped a lot of turnkey companies, a lot of companies have started from tutelage from us in the past, and so I thought it's just good to talk about what makes good ones and bad ones and how an investor can make a good smart decision. Well, like you said, there's a lot of turnkey companies, not only in Memphis but around the country, and there's some startup turnkeys, there's some mid-size turnkeys, and then there's some very large established turnkey companies out there. So Chris, let me put it back on you first. What do you think the meaning is of a turnkey company? What do you think the definition of that is? Yeah. Well, you know dad we talk about this all the time that it is so confusing out there today, especially with, and we'll talk bigger pockets for a second, because there's so many investors today that come through bigger pockets, so they know about that online form. The word turnkey is mentioned constantly. There's a lot of companies that market with the work turnkey because it's glitzy and glamour, and it just attracts a lot of eyeballs. But what turnkey really means, and there are just so few companies out there today that follow this model, and for us it means that whomever you're buying a property from has previous purchased that property, paid for a complete renovation to the property, eliminating deferred maintenance, that's a big one for us anyway, then they place that property in a management company that they own. So it's full cycle, it's all start to finish, everything is done in one spot. So an investor, they're not told to go call the management company when they have a problem with management, they call the company they bought it from. There's one company that raises their hand and says, "Hey, we're responsible for everything and for the experience you're going to happen." There's just so few companies out there like that today, but that's what we really feel is a true turnkey experience for a client. So having said, what I mentioned a minute ago is that we see some startup turnkey companies that don't have all of that process, they talk about some of those processes but they don't have them all, then there's some medium sized companies, which I think we're a large sized company with almost 5,000 properties that we manage and all being single family homes that are in the turnkey space. But there's a lot of differences between certain type of turnkey companies, and we've seen them come in our office that have vision of wanting to be a turnkey company but really don't have the commitment. To me there's a big difference about whether you're going to be in this for the long run. And when you're a true turnkey company it takes a lot of money to be a turnkey company. This year we're on schedule here after the first quarter here of 2018 to buy somewhere between 800 and 900 houses, which means renovation 800 to 900 houses and then of course selling 800 to 900 houses. With that comes the obligation of a lot of money that you need to be able to do that because today we're buying a house, and renovating it, and selling it, and we're completely out of the house in about 115 days, from the beginning of that time we put our money out to the end when an owner actually purchases a house and closes on it. So we're about 115 days, and we may have anywhere from 200 to 250 houses out, and maybe more at any one time that are in some form of that process right there where we've paid them. So you can just do the numbers real quick on what type of many you need. So how do you think companies are getting started today, Chris, out there in the turnkey and being able to go out there and get the kind of money they need? But more importantly for our listeners, to be a turnkey company what do you really need to be able to get started? Well, and it's funny dad, I want to answer that but I want to touch on one thing that you said just a second ago. Do you remember the guys that came in, I don't remember their names or anything, it was a number of years ago, they came in from Atlanta and they wanted to model us? And so they spent, what, like a day and half or may two days with us because they wanted to duplicate what we did. Do you remember what they said when they were leaving? These are the guys that looked at us and they kind of smiled and said, "Y'all work too hard. This is too much work." The last thing they wanted to do was go into the turnkey business after they saw what it takes to really be good. Remember that? Yeah I think they had read some of those four hour, six hour workweek books, or eight hour workweek books or something, and figured they'd come in here with all the systems and processes that we had and figure out how to do it on the cheap and on the quick turn. Yeah, so it's funny when you were saying that a second ago on what it takes, because it really does take a commitment. It's not just money but it's a commitment. So how do these guys get started today? I know a lot of your listeners, they're trying to decipher what makes somebody good or what makes somebody bad. They may have other investors around that they're trying to counsel or that are asking their advice on how to get started. The reality is that a good turnkey company today, as you said, they do have deeper pockets behind them. They have the ability to, as you said, buy and renovate and hold. Because sometimes you have to hold a property, like you said, for us it's four to five months before that property moves all the way through the system, so it takes good financial backing, it takes a great team. I mean, what are we up to now? Have we eclipsed 90 team members? We're between 85 and 90 people that work for us in all five cities that we have now. Yeah, so it's not like this is a small thing, and that's what I try and tell people. There's that idea that you can stay small and keep it all, and we know companies that do that. We know companies that they're turnkey, they run the full turnkey model, but when it comes to let say user experience, how is it for the investor on the other side? Probably not as good as it could be, right? I mean if you don't have the team you can't do those things. So we always tell people that look at the team. Right off the bat if, you know, the bigger the numbers are that somebody says they do and the better service is they say do, well then their team has to be big. If somebody says, "We've got seven total team members that work here doing hundreds of properties a year." They're probably either inflating what they do or they're just not very good at providing service. They may turn houses out but that doesn't mean they're going to be good, that doesn't mean they're going to be renovated, it sure doesn't mean that the management experience is going to be good. Well, and then when you break it down and if we take a look at our turnkey process, I think we have today, oh what do we have, seven to eight people that work in our buying department. In a couple of cities we have probably close to 15 people, 17, that work in our renovation department, which includes doing assessments on houses before we buy them, includes doing a renovation list, which includes doing move out list. Probably have another couple hundred vendors that work on our rehabs for us at any one time, then in our sales department we have another probably six or seven people that work in that department, and then our closing department, just to close them that we sell to investors, we have three, four, five ladies that are all involved in that process. Then in our back office administrative side of the business we have another four to five people working in that side of the business. And then we haven't even gotten to the property management side yet, which is another 20 or 30 people that work in that department. That's just in the city though. Yeah, that's just in Memphis, to support the processes and systems that we have to go through with renting the house and managing almost 5,000 properties. Yeah, you know, your particular listeners, the entrepreneur out there, the person that's attracted to the whole idea of experience matters, they're looking at this company and the way it's set up and this company's set up ... It's kind of funny, this company was always set up for this kind of growth, wasn't it? Because it's just a function of people. Everything's been departmentalized, everything's been siloed so everybody has their own piece of the puzzle that they have to do in order for the whole thing to work, right? And then if you want to do, like you just said, we've never done 900 houses in a year before, but when we decide we want to do it, it becomes we need a little more money, we need a few more people over here in renovations, we need maybe one more person on the buying side. I mean, it just becomes a function of people. Add a person and you add 100 houses or whatever it ends up being. Well, with that also comes the processes, the systems, the hiring, the training, and again all of that stuff over and over again, and again, without some of the systems and the processes and the training that we have in place with not only our staff but our executive team that oversees all of this, plus our middle management guys and gals that oversee all of this for us. So we've got a lot of processes, we could probably do with the team that we're gearing up to, to look at other cities right now, we could probably under this umbrella probably get close to 1,000 houses with where we are today. I want to give a quick shout out to something though, dad. Five cities. Again, we're well connected to a lot of different turnkey companies out there, whether it's through Master Mods. To say we're mentors to them is a little too strong but we do give a lot of advice, and we'll spend time answering questions. Some people say, "Why would you do that if they're a competitor?" And the reality is that we don't have very many competitors. There's other companies out there, there's just not very many people that do this, in fact there's none that I know of on the level we do. And no one, I was going to point out, has figured out how to go to another city and make, as you've always said, kind of like McDonald's, make the same burger and the same fries, everything is exactly the same in each city with the way it does, and you mentioned three times their training. I just want to point out that's been a big focus the last couple years. Through experience we learn that you can't just open up a new city, you have to train your people, you have to have a set way of training and programs they have to go through. It's not you start on Monday and you're working Tuesday, it's you start on Monday and two weeks later you're starting to figure out a little bit about what you do. Yeah. So let me ask you another question. What is the difference in turnkey companies, and how do you find a good turnkey company and know that they're better than other turnkey companies that may be out there? Well, this is a question that gets asked a lot on BP, on Bigger Podcast, and I've told people, one of the quickest ways you can find out is, is this person really a turnkey company is you can ask those questions of one, are they investors? Do they own properties in the cities that they're in? Do they manage their own properties and have their own management company? But a big one, and this is one that kind of gives you a quick indication of are they well funded or are they under-capitalized is you can ask a company, "Do you negotiate?" If you find a turnkey company or a turnkey property somewhere for $100,000, and you decided that's too high and you want to offer them $90,000, are they running to get the contract done as fast as possible and get you under contract at $90,000? And if so you can pretty well bet that they're underfunded, they're probably not high quality, they are essentially trying to just move things and make a buck here or make a buck there as well as they can. As we both know, a good high quality company is going to know their value, number one, and value's more than price, they're going to know what they bring to the table. They're going to have a price for a purpose. It's not a, "You just tell me what you want to pay," but, "I'm offering you this property at this price, and what you get in return is this really high quality service." And somebody that can stick to their price and say that, well then they know their value and they're well-funded because they're not trying to just move property to make money, they're actually trying to build something long term. You know what I mean? Like what we've done here. That's a quick fire way for an investor to know, am I dealing with someone that's trying to flip houses and make some quick money off me, or am I dealing with somebody that's going to be around for a while, that what they bring to the table matches what I need? And there's a lot of companies that are coming out as a turnkey company, they are really, so all I would suggest to our listeners is that depending on what side of this you're on, whether you're an investor getting started or whether you're a potential client of a turnkey company, is that you know what you're doing up front, you know what type of company you're dealing with. Are they more interested in just selling you a house or selling you an experience? Just recently we've changed our model, just beginning of this year. We don't sell one house to anybody anymore, we're selling portfolios now. Chris Clothier: To new clients. Kent Clothier: To new clients. A minimum of two houses. An existing investor could buy their second, third, or fourth one, and continue to build out. But when you really know if you're on the right mark as far as turnkey is if you have your repeat customers, your existing customers repeating their sales and buying more houses. And that's what we work on every single day. And again, do we talk to these one house buyers? Yes, but we try to show them why it's to their advantage to build a portfolio and not have just one property. Yeah I agree. I mean I agree 100%. It's kind of funny, I keep going back, alluding back, to the name of your podcast, and the people that listener to it, all of your listeners out there dad, we talked about it a couple weeks ago. It's about the experience that the investors going to have. We've learned over time that a one house investor does not have the same high level quality experience that an investor with three or four or even five houses will have. It's a difference, and it slows them down as an investor, it makes them less excited about planning for their future. We've learned. I mean I guess again, why would an investor want to ... It makes sense to not go out and buy 10 houses in one day unless you're an experienced investor, but if you're getting started off and you're not willing to buy two properties with the company you're working with from the beginning? Now just two, but if you're not willing to make that kind of commitment to improve your experience and get started well then they may not be the right turnkey company for you. You may not be ready to get started yet. So all of those thing are important as you visualize and analyze what type of investor or business you're going to run when it comes to the turnkey space because again when you get into this turnkey arena you have to really be good at your processes and your systems or it's not going to work long term. This is a big commitment, this is a long term business plan here that you have to develop and work through, including hiring the people that you need to continue to build the model out to manage more houses, to be able to service not only your vendors but your residents and your investors, and of course the staff, your employees that work for you. That's what we try to work on are those four areas, always do better with those four groups of people. But the turnkey space is a really, really big opportunity if you have pretty deep pockets and you want to make the commitment to get into this space and do it really, really well. It is a lot of work, it's a grind, but it can be very rewarding for you at the end of the day if you make the full commitment. Chris, let's wrap this up. What else do we got on the turnkey platform? Well, I'm sure there will be more coming, I'm sure that there'll be lots more topics to cover here, real estate related especially and turnkey related. I know that Kevin is ready to jump back in to this seat here and take over this microphone, so I appreciate you letting me come on and do a few sessions with you, and I'll step in anytime that you want me to. Give me a copy of that book over there again. Let me plug it right here on video as we wrap this one up here for our listeners and our viewers. So Chris has come out with The Turnkey Revolution, I believe it's available ... Where today Chris? They can pre-order now at Barnes and Noble, at Amazon, we even have bulk copies for entrepreneurs out there that want to share with their teams or clubs and groups at 800-CEO-READ. So lots of places they can go to get the book right now. It's actually going to ship and publish in bookstores on May 4th. So there you go. He's going to ship and publish on May 4th, it's about 200 pages in paperback of a lot of chapters talking about the turnkey revolution, so again I'm holding it up here, by Chris, so encourage you to reach out and grab a copy of it and see if it brings you some insights and new ideas to your business, maybe something other also than the turnkey platform. So a lot of good ideas and a lot of good content in here. So thank you Chris for being on here today. Again, we'll wrap this up by thanking our listeners and viewers for being on here, and again you can find us on MemphisInvest.com, Stitcher, SoundCloud, and iTunes. Leave us questions, we'll be glad to answer them for you which we do all the time. And again, thank you for joining us today and have a great day. Thank you.